On Friday a federal judge in Texas ruled that Obamacare in its entirety is unconstitutional and declared it null and void. While this does not immediately do away with this bill, it does place it on the path to its own destruction. A federal judge delivered a stunning rebuke to the Affordable Care Act late Friday, ruling the individual mandate is unconstitutional and nullifying the entire ACA in a case brought by 20 Republican state attorneys general. The left is having a fit, claiming they’re going to appeal this ruling, but what they don’t understand is by stripping the bill of its mandate, forcing people to have coverage or face a fine, Trump and the GOP stripped Obamacare of its tax status the Obama Administration had pleaded and won before the Supreme Court, due to that it is dead, just going through the motions until the appeal process is done. 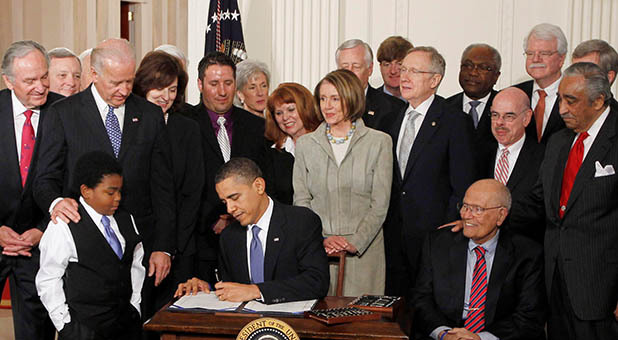 I think the DNC thought they had Trump and the GOP when they kept Obamacare in place, just stripped it of its tax status by removing the fine for not having it, but by doing so the GOP did a run around that would strip the bill of its protection under the Supreme Court ruling, they stripped it of its tax status. While the bill has to go through the appeals motion, it will not hold up in the high court because it is no longer set up as a tax, we can now see this unmitigated disaster end before it sinks us economically. What I would like to see is some type of government subsidies for high-risk insurance, this is how they did it before, then take away the prohibition that is preventing insurance from crossing state lines, but making it more competitive, you will see the services increase with the price go down. If we add to this a separate government fund for high risk, you take much of the risk away from private insurance, they then could price down even further. While taking care of the high risk would not by any means be cheap, it is a drop in the bucket compared to putting everyone in this nation on universal health care. At this point I am overjoyed that a terrible bill is gone, it would have most likely bankrupted this nation over time, now the legislative branch can work on something that will work, and unlike last time they will be forced to deal with GOP concerns this time, something they refused to do when they crafted Obamacare. NextMueller Following Clinton’s Lead and Destroying Evidence. Hey Democrats, No Collusion, What About Russia?